Shot in one single take, Russian Ark (2002) follows a 19th century French aristocrat who meets various historical figures as he travels through Europe's second largest museum – the Hermitage. Other films set in St Petersburg include Anna Karenina (2012) James Bond: GoldenEye (1995), the British TV mini series War & Peace (2016) and the up‐coming feature film Siberia (2018). As Russia is not part of the European Union, you need a visa for visiting – even as a EU citizen! Applying for a visa on your own can be a very complicated and expensive process. Thus, my recommendation is to go on a guided group tour. You will usually travel by ferry from places such as Stockholm (Sweden), Helsinki (Finland) or Tallinn (Estonia). Once you leave the ferry, you get up to 72 hours "visa free time" in St Petersburg. We arrived on the colourful ferry "Princess Anastasia"
I found 72 hours just about enough to see the highlights of the city. 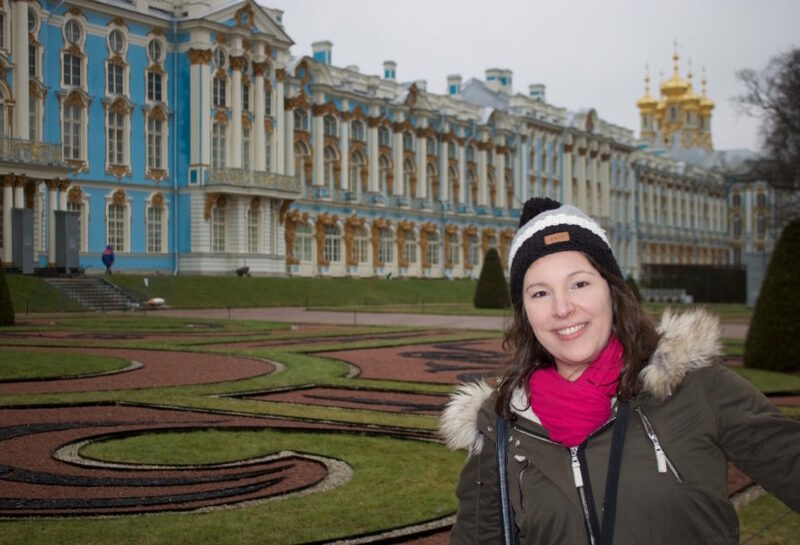 Plus, a group tour is certainly a lot less stressful than having to organise a Russian Visa by yourself. A guided group tour is also a good idea because not everyone will speak English in Russia. In fact, very few people do (even in such a large city as St Petersburg). You will also feel safer. Although I personally didn't have any negative experiences, I've heard that foreign visitors do occasionally get robbed etc. (especially on the metro). June‐July: This is the main season as many visitors want to experience the so‐called "White Nights" when the sun hardly sets at nighttime and the days are very long. 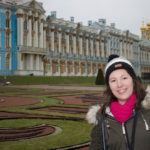 Spring (April‐May) or autumn (September‐October): The so‐called “shoulder season” is best to explore St Petersburg without the crowds and the high accommodation prices in the summer. On my guided group tour, we stayed in the VeloHostel. The best thing about this hostel was that it was located just off Nevsky Prospect – Saint Petersburg's main avenue for shopping and restaurants. Along Nevsky Prospect, it's about a 20–30 minute walk from the hostel to the Hermitage State Museum. Furthermore, the rooms were reasonably clean and there was good working Wifi. Just a few steps from the hostel, the coffee shop Stolovaya Tarelka (Kolokolnaya St. 19/18) offers a great range of breakfast items for little money. 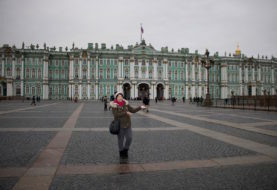 Even closer to Nevsky Prospect, the river and the Hermitage Museum is the medium‐priced Mini‐Hotel Diva. I found the local Russian cuisine here (and those from neighbouring countries such as Georgian cuisine, which is very popular in St Petersburg) surprisingly modern and varied. Even for a vegetarian like me. Plus, eating out is pretty cheap. Especially if you are used to North American or West European food prices. Borscht Soup – One of Russia’s best known traditional dish. Usually made with beetroot and pork, but vegetarian options are available, too. Just ask the waiter. Vodka – THE ultimate Russian drink! In St Petersburg it comes in many different flavours with some of them (ie. with berry juice) actually tasted pretty good. Russian dumplings – Typically Russian are a good option for meat eaters and vegetarians (for example filled with cheese) alike. Russian women generally dress quite feminine. So ladies: If you don't want to stand out as a tourist, try not to dress too "leisurely". Russians also rarely greet each other with a handshake (particularly women), so just nod. Currency – the Russian currency is the "Rubel" (1 Euro is approximately 70 Rubel). Credit cards are accepted in many places. But just to be on the safe side, make sure you exchange some cash before you come to St Petersburg. Splitting the bill and paying by card in restaurants – As we found out, both is often not possible. So bring some cash whenever you eat out as a group and pay the bill together. Taxis – agree on the price before you board, otherwise you can be sure to get ripped off! The St Petersburg Metro has one of the most beautiful free art galleries in the world. To be on the safe side though, it's better to go in groups. Language: Be prepared that you will encounter quite a lot of people that speak no or very limited English. The most important word to remember in Russian is "spasibo" (pronounced: spasiba), which means "Thank you". If you want to say "sorry" to someone, it's "izvinite". The tab water in Russia is not drinkable! So you need to buy bottled water. Due to potential clogging, there are quite a lot of places where you should not throw toilet paper in the toilet, but in a basket next to it. Disclosure: This blog post includes affiliate links to GetYourGuide.com and Booking.com. If you click on any of these links and make a booking through this link, I will receive a small affiliate fee.